Cinco Ranch High School student starts petition to reduce homework, Tracy Clemons reports. KATY, TX (KTRK) -- Every night, Cinco Ranch High School sophomore Luke Austria spends about four to six hours doing homework at his family's kitchen table. "You do get to kind of learn it on your own and get a little bit of practice outside of school," Austria says. "But I just don't see the benefit in the amount we receive." The homework comes after a whole school day, and a long list of extra-curricular activities including marching band, tennis and Boy Scouts. "Monday night I was up really late, past midnight. But I kind of snapped and I just decided I wanted to make a petition. I wanted to do something that would lower my homework," he said. On Tuesday morning, at the end of his first period class, he wrote up a Change.org petition that's gotten more than 8,200 signatures. "Certainly I knew what his study habits were," says his father Romer Austria. "But I had no idea it got to the point where he was frustrated enough to decide to pen a petition." Romer Austria says make no mistake, the family undoubtedly values homework, "but when it reaches a level that it interferes with a student's amount of sleep, when it interferes with things like family life, church, and even having a social life, I think it's something that should be of a concern to people." 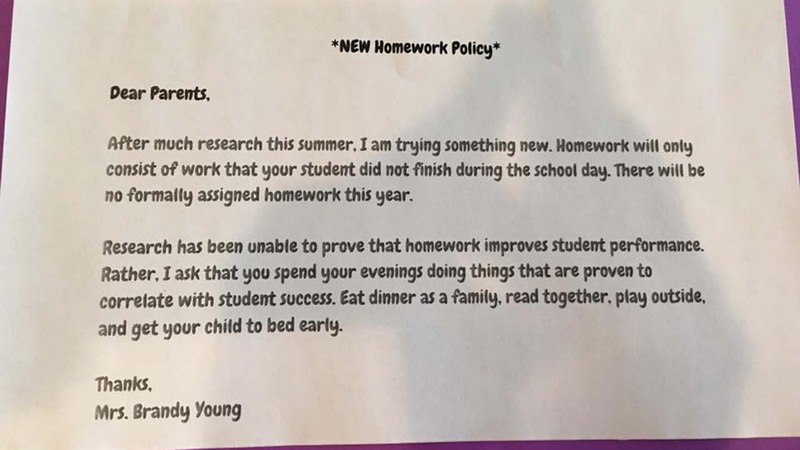 One teacher in north Texas is starting the school year with a revolutionary policy - no homework. In a statement to ABC13, Katy ISD says, "oftentimes, the amount of homework assigned to students varies depending on the subject and grade level. Nevertheless, this is an opportunity to review practices and have a broader discussion about how, why and when homework is given." "I think certainly if anything, if it starts a dialogue between parents, concerned parents, and the school district, it certainly can only be a good thing," Romer Austria says. While they consider the possibility of Luke stepping down from an extracurricular activity or pre-AP class, they also hope the district will explore more homework-free days than the students are currently given. "I just have memories of me in junior high, my older brother pulling all-nighters in high school and I just didn't want go through," Luke Austria says. "Katy ISD is aware of the online petition requesting that the District reduce the amount of homework assigned to students. We certainly recognize and appreciate students' and parents' desire to streamline the amount of homework assigned, and thank those who have signed the petition for sharing their concerns and generating this discussion. Oftentimes, the amount of homework assigned to students varies depending on the subject and grade level. Nevertheless, this is an opportunity to review practices and have a broader discussion about how, why and when homework is given. We look forward to receiving and learning more from the petition. In the meantime, if a parent or student is concerned about the level of homework assigned at their school, we urge them to visit with their campus."